Legend has it that Billy the Kid killed 21 men, one for each year of his life, but the truth is that he was probably responsible for just four. Born in 1859 probably at New York City, his real name may have been Henry McCarty and he used the aliases Henry Antrim and William H. Bonney. In April 1875 he was arrested for stealing cheese and again on 24 September for stealing clothes and a gun. He escaped from jail via the chimney and became a ranch hand. In 1876 he moved to Arizona and became a horse thief. Lincoln County War, a conflict between businessmen and local ranchers. In March 1879 Bonney met Lew Wallace, the Governor of the New Mexico Territory, with a view to seeking an amnesty for his part in the Lincoln County War. Bonney agreed to testify and spend a short time in jail in return for the amnesty. However, John Dolan, the district attorney, ignored Governor Wallace’s instructions and Bonney was forced to escape. He lived on his wits and in January 1880 he killed Joe Grant during a fight in a Fort Sumner saloon. He later said, “It was a game for two, and I got there first.” In November 1880 barman and former buffalo hunter Pat Garrett was elected as sheriff of Lincoln County. 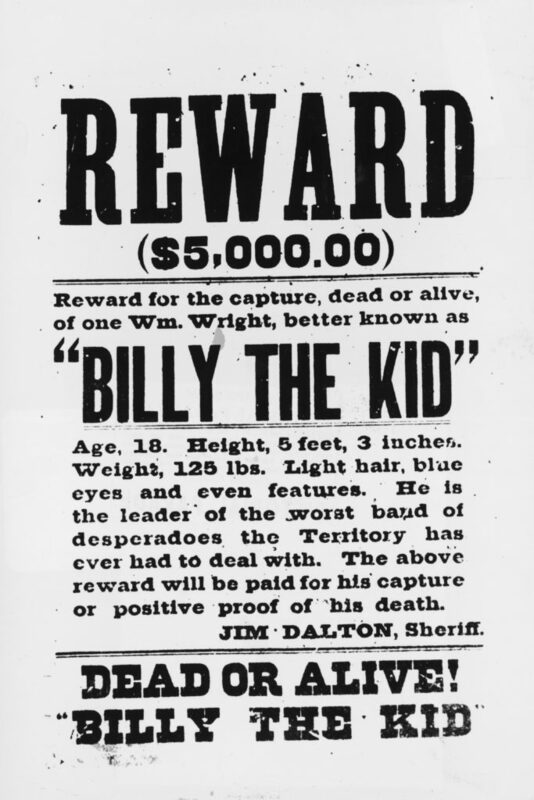 In December he announced his intention to capture Billy the Kid and claimed the $500 reward. On 19 December one of Bonney’s friends Tom O’Folliard was killed in an ambush at Fort Sumner. Four days later, another friend a cattle rustler named Charlie Bowdre was mistaken for Bonney and killed. Bonney was captured and taken to Las Vegas where he wrote to Lew Wallace seeking clemency but received no reply. Bonney went on trial on 7 April 1881 and two days later was convicted of murder. On 13 April he was sentenced to hang. On 28 April he killed two guards and escaped from his cell. On 14 July Garrett and two deputies set out to capture Bonney. As he entered a darkened bedroom in Fort Sumner, Garrett shot him dead. Lew Wallace, the Governor of the New Mexico Territory, to whom Billy the Kid appealed for clemency, wrote the novel Ben-Hur. Billy the Kid’s brother outlived him by nearly 50 years and died a tramp in Denver.